Here’s another kite model hitting the waves and is really making waves amongst the kites sold in the market. Reviews are awesome and that this type of gadget for the sports is a must have. The new F-One Bandit 5 (V) is the new designed kite that offers better performance and safety than ever before yet it performs at all levels no matter what your skill level is. Range: To increase further the range of the Bandit 5, F-One needed both a kite that you can easily power-up in the low end and a kite that was even more giving in gusty and strong conditions. Lightness: An additional lightness was given a priority at the bottom end to provide much more improvements of its performance when under powered. Handling: To position the kite immediately where you want, to precisely manage its rotation during a kite loop, and to have the most responsive kite in larger sizes, its maneuverability is crucial. This is why we focused on this particular aspect. 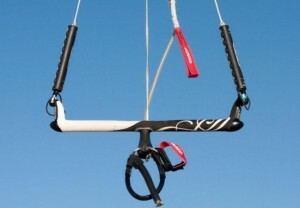 The One Pump System allows you to pump the whole kite with just one valve. Safety clips on the connecting tubes isolate the struts from the leading edge. The neoprene cap is simple and effective and every tube is fixed with a security clip to the valve. The security clips are easily removed in case of bladder repair. 2 different positions on the back lines wingtip allows for more bar pressure and a slower turning kite or lighter bar pressure and a faster turning kite. Most seams on the leading edge are now reinforced with Kevlar to prevent the seams to deteriorate on aggressive ground friction. They protect the leading edge from damage whenever the kite comes into contact with the ground and significantly prolong the life of the kite. Each skin of the kite is sewn and reinforced by a self-adhesive Dacron for extra strength. The leading edge tips are profiled and have a reduced diameter to avoid any bridles tangling and drag effect. A new batten closing system enables F-One to reduce its diameter in order to decrease the drag. A small batten ensures the closing and holds it in position. The Bandit 5 struts are designed with a vertical cut in order to optimize the strength/diameter ratio. This single design is solution for all types of riders for one clear choice. It combines strong features such as safety, performance, wind range, easy auto relaunch, simplicity of setup and unhooked riding without any compromises. The kite structure, profile and its bridles have been reworked in order to attain the above said goals. Its construction has also been made in a step-by-step fundamentals plus updates in both aspects of choosing and distribution of materials in the manufacturing processes. Because of the soft kite structure, it can deform and twist to allow full rotation. A fully rigid profile wing will not turn at all. 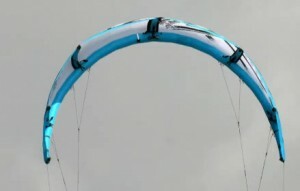 Therefore, the maneuver and responsiveness of the kite depend directly on the twisting ability, this is one important point that F-One have improved on, thanks to a thinner leading edge, new shape of struts and a new 3-point bridle system. All these great features were made to free the kite’s profile. Decreasing the diameter of the leading edge with almost 25% less air volume brings an important amount in terms of aerodynamics and weight. The results are better performance in the low end. It does not only provide incredible ability under power but also at the top end. Riders are all praising for the improved thin handling profile the kite now has. F-One has also gained in terms of set up comfort as the inflation time has been reduced. A new type of flatter profile was employed by reducing the profile curve depth making the Bandit 5 (V) easier to depower and keep control at the top end. In the low end, a flatter profile is more efficient when powered-up and fully sheeted in providing constant power. The result is a better control of the kite aerodynamics, less lateral traction and less pressure and therefore effort through your legs and into the board when the wind picks up. Finally, some important work was undertaken on the bar feeling and pressure. The feedback from the bar provides you with constant information and lets you know what’s going on allowing you to adjust the position, the pull and the speed of your kite in the wind window at any given time. 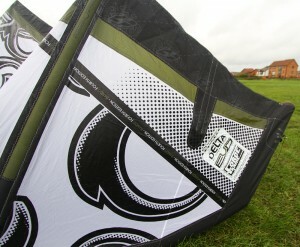 The following review comes from iksurfmag.com, a magazine which writes reviews about all kind of kites. Their site is however flash based and you need to have Flash installed to be able to read their site. Anyway, here is the review. F-one created a storm in 2007 with the Bandit, a whole new concept in kite technology the Bandit was a Delta shaped kite aimed at being really stable and easy to fly. It was also a kite that could do it all; ridden by the Pro Team and beginners alike it was somewhat of a revolution. Last year the kite was tweaked and refined to bring the public the Bandit Dos. But this year there was speculations about what the kite might be. Well the speculation is over!It is the Bandit III and this year it is quite different… The team wanted to improve the top end range of the kite and also the amount of control felt at the bar end. The kite looks quite different to last year and it is higher aspect with a much shorter middle strut. The real news lies in two improvements, which will sway a lot of people who weren’t convinced before. Gone is the long bridle, so now you have 4 lines all the same length on the bar. This hugely reduces the chances of the kite getting tangled inside itself in the waves, and also makes it much neater to pack away. Next up is an external one-pump system, which is just about the icing on the cake. Elesewhere, when you look at the dealing on the canopy, you can see this product oozes quality. At a time when some brands are cutting costs it looks as if F-One have gone all out at the factory! This year the bar has been simplified somewhat; the trim straps on the rear lines are gone and replaced with simple floats. 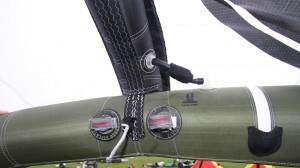 Under the floats are knots in the leader lines so you can still adjust the backline tension if you would wish to. The chicken loop release has been slimmed down a little and works really well. It also has a solid plastic male pin that fits into the bar to lock the loop in place when you are unhooked, and the top part, which was plastic last year is now made from inox metal and has a loop for your leash for a suicide set up. The clam cleat above the bar depower is back as is the mini 5th line safety which will totally depower the kite in an emergency. Overall the bar is cleaner and simpler than last year, yet still retains all the important bits you need to fly the kite. Last year when you flew the Bandit Dos it was quite tricky to distinguish it from the original, this year however the Bandit 3 is a totally different animal. Because of the higher aspect the kite flies much furtherforward in the window, developing a pull completely different to the Bandit II. 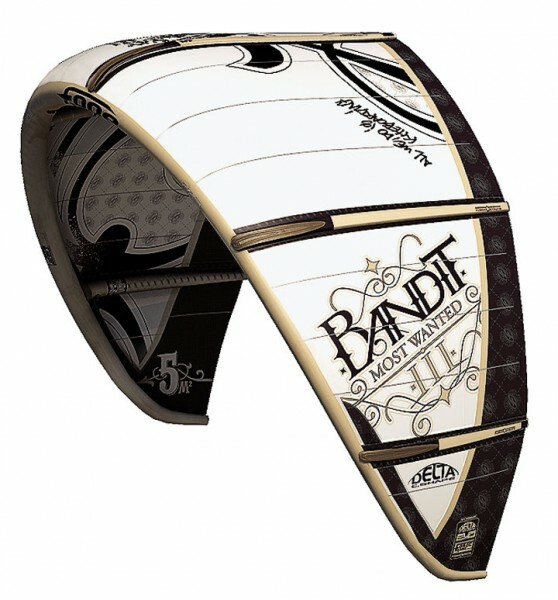 In previous years the Bandit has always had a great low end, the new higher aspect ratio vastely improves the top end of the kite, but using some clever profiling of the canopy the kite still develops its low-end grunt. The 10m gets going really early and coupled with a surfboard it could easily satisfy a one kite quiver for lighter riders. Another improvement over the last year is the depower throw has got much shorter. Meaning that just small movements with your arms can dump the power from the kite and put it back on again. In gusty conditions this is great for maintaining an upright stance and allows you to control the kite rather than the directly down the window. It also does some impressive kite loops, taking a much wider more powerful radius as opposed to spinning on its axis. Riding the Bandit III as a freestyle kite is certainly rewarding, and it really comes into its own as a free ride and wave or even just with the simple things like easy relaunching. A really polished kite with that not only outperforms its precedessors, the improvements in the design also make it stand out against it too. Features like the one-pump system and the shorter bridle will have previous non-converts reaching for their wallets! This is about as good as it gets in terms of finish and all round performance. We used to complain about the lack of one-pump and the long bridle. This time in terms of complaints we are silenced! One of the best looking kites out there in terms of graphics and attention to detail. Happy to perform with whatever conditions or style of riding you throw at it the Bandit III looks set to have another stellar year. I ordered a Bandit 4 size 12m from internet and it has finally arrived! Taking a closer look at the kite I see that the construction is great and the kite is overall very well made. The reinforcements are strong and there are two connectors on the backlines. Inflating the kite goes very light and the one pump system works perfect! the new inflation system has a stopper ball, so you don’t have to worry about getting your thumb into the inflation hole as quick as possible when you release the pump. There are no zips over the inflation connectors, just velcro and two struts are removed, so lots of weight are gone. Comparing Bandit 4 with Bandit 3 is like comparing a Ferrari with Fiat. The wind is light the day when I have the premiere with this kite, only 12 knots, perhaps 14 knots in the gusts. No one is one the beach so I have to self launch by letting the kite drift into the power zone, then I pull the back line and the kite is airborn, peace of cake! So it´s time for the first dive and I´m afraid that I´ll sink to the bottom, my board is quite small on top of the light wind, but to my surprise I’m starting to cruise, faster and faster! The kite has a very good low end and generates a constant pull. The kite has it sweet spot when it´s parked at 11:15, compare that to Bandit 3 which has its optimal position in 11:00. The kite is turning fast and the bar pressure is low. I´m riding with the 55 cm bar, but still better than I expected. You have a very direct feel when you turn and if you´re turning to fast in the transitions the kite even generates some lift. The wind was picking a little so I was able to jump and it’s now when you really feel the difference between Bandit 3 and Bandit 4. The lift is the same, but the hang time is way better!! Due to the kites responsiveness it´s easy to get the kite out of position when you’re jumping, but the long hang time gives you plenty of time to correct mistakes in the air. A couple of sessions later. I made up my mind, this 12 meter kite will be my new light wind kite, it simply pulls harder than my 13m Bandit 3, perhaps will even a 11m make the trick! A russian guy called Mikhail Soloveikin has this to say about Bandit 3. 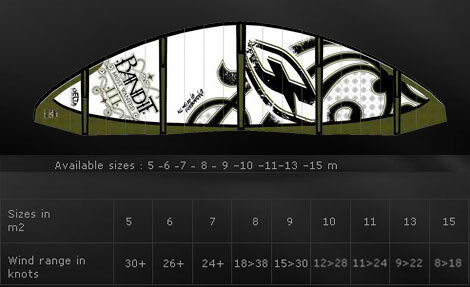 Hello, I want to introduce you a new kite: F.One Bandit! Appearance of the kite is very similar to the Bandit Dos. The main changes are in the kite settings. LE support is standard for the Delta kites. All 4 lines have equal length, so you can use any bar that you wish. The new bandit bar has no remarkable changes, but the current bar might be upgraded in the future. 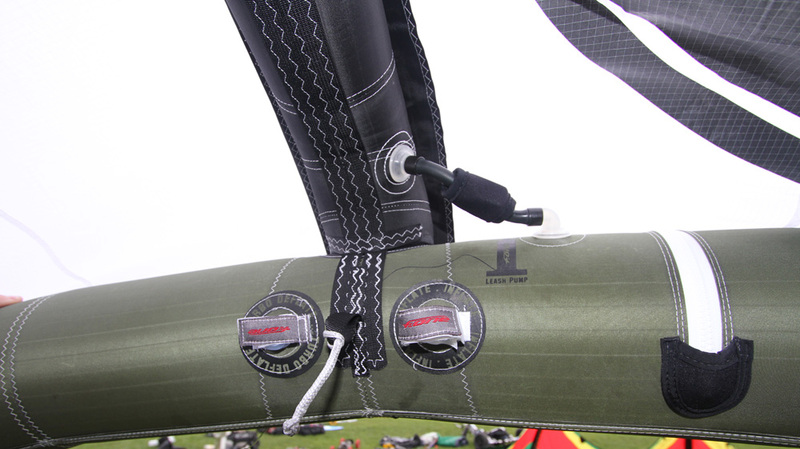 The bandit 3 has a one pump system, which lets you inflate the kite quicker. 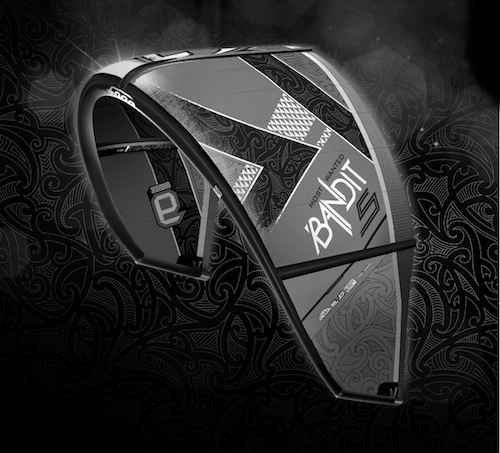 Kite power depends on your speed, the Bandit will require you to ride faster to achieve better performance. I have enjoyed how the kite gives out power in a turn. When the Bandit Dos has started to turn its power came a little bit faster. Bandit 3’s power is more natural, and the kite passes through gusts better. When the power increases it won’t be unexpected to you and it will let you to control the kite better without looking on it. I have also liked the new Bandit’s depower configuration. I has a wider wind range than Bandit Dos. It won’t be a problem to depower the Bandit 3 in overpower conditions, even for a beginner rider. I especially enjoyed how the kite performs when you are riding unhooked. Finally f-one has succeeded to adjust the kite for unhokked jumps. Pressure on your hands is insignificant and lets you jump on a high speed. After poping there is less pressure on your bar which makes handle pass and landing easier. Bandit 3 is a good kite for big airs. Bandit’s hang time was significantly improved. Improved kite control will let you focus on your jumps. It’s also much easier to relaunch the new Bandit after it has fallen. It might be more difficult than on a classic bow kite, but it shouldn’t be a problem for riders who have experience with relaunching. This kite is also good for waveriding. At last waveriding is possible not only hooked but also unhooked. The power of this kite is practically not changing when unhooked. Bandit 3 is a very stable kite if your speed is high enough. This kite is for advanced riders, it will let you jump unhooked on high speed and make handle passes easier than ever before. It perfectly fits aggressive waveriding, hooked or unhooked. I thought it was time to try a different kite after 2 years with Cabrinha and Royal Era. I´ve been very happy with my Cabrinha and Royal kites, but I’ve always been a bit unsatisfied with the bars. The bar to the Royal Era has a huge safety bar cuff, (you know the molded the plastic piece above the chicken loop) which always make me a bit nervous since I might hurt myself if I crash and get the thing in my head, or even worse, ruin the glass on my water proof breitling watch. The lines are also very thick and I often end up swearing when the lines are all tangled. The Cabrinha bar is great, until it start to fall apart… The de-power strap tends to get worn out quite easily and when it brakes, then you have no stop and if you lose the grip of the bar, then you can hardly reach the bar when it’s hanging 1 meter above your head. So, it was definitely time for a new kite with a good bar! 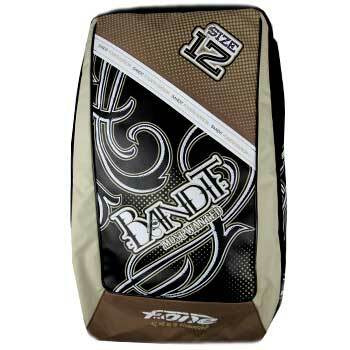 My choice fell on F-ones Bandit III kite and it sure does have some qualities! The pull is very constant from the bandit 3 kite. Some kites lose their pull at 12 o’clock, but bandit 3 does not, which is an advantage when you jump. You get a smooth lift up in the sky and the ride through the air is under control. The turning speed. My bandit 3 kite is a 7m so even though it should be a fast kite, the turning speed is insane! Wind range. The low end on the bandit 3 is superb. I can easily go upwind in 9 m/s and also be able to ride kite in extreme wind conditions, 20 m/s is no problem as long as you depower as much as possible. There are however a few less good things with the bandit 3. The lines are super thin and feel a bit crappy. I´m just waiting for them to snap, but I’ve been lucky so far. Perhaps did F-one use spider web or some other mega strong material, but I doubt that. Unhook issues. It’s hard to unhook when I’m riding with full power, the tension in the chicken loop is to strong, so I´m forced to de-power before I go unhooked. Another “bad” thing is that the kite is still very responsible when I’m unhooked. So the tiniest pull on the bar make the kite fly back to 12, or worse, in the water =P. What’s is so damn special with bandit 3 kites or f-one kites in general? If we ignore the fact that the design is totally awesome, then what makes bandit 3 kites better than for example Cabrinha kites, Royal kites, Naish kites, Liquid Force kites or any other kite? Many pros are kiting with bandit kites for some reason… let’s try to find out why. F-ones bandit 3 kite was released in 2010 and the manufactures has really done some improvements if we compare the kite with the precedessor, Bandit (II) Dos. Bandit 3 has not only a cooler design, but also a more c-shaped profile, also known as the Delta C-shape. You can call Delta C for a refinement of a hybrid-kite (a kite that combines the best parts from c-kites and SLE-kites). F-one put lots of effort in aerodynamic researches when they invented the patented Delta C-Shape. Another advantage with the Delta C-shape is the “auto” relaunch function. The wing-shaped arc will make the kite to rest on just one point once the kite is in the water with the leading edge pointing downwards. This construction of the arc will force the kite to roll over on one side and th ekite will rush to edge of the wind window once it gets into vertical position. Another good thing with the new bandit version is the one-pump system which sort of is standard on kites nowadays. The kite is connected to the bar with 24 meter long lines and the bar is of course improved. The bar delivers a lot more depower than the previous version and when you pull the bar the power comes immediately, but still smooth. The pressure on the bar is slightly above medium. Above all, significant for the bandit 3 kite is its great stability in the air. Even during rough wind conditions the kite remains rock solid in the air, you can really tell the difference here if you compare the bandit 3 with other kites. We end this article with a little trailer about Bandit 3 from F-one.